If you’ve not checked the calendar recently, it’s time to start preparing your taxes. That also means something else – looking for overlooked tax deductions you might have missed throughout the year. Thankfully we have a good CPA who helps us stay on top of deductions, though we still don’t like to miss any opportunities. I keep pretty good records, but always like to make sure I’m not missing any commonly overlooked tax deductions. This helps us save more money and not give it to the government. I know that I’m not the only person looking for tax deductions for 2018, especially with the tax changes this year. Just remember, I’m not a tax professional. If you have specific questions about your situation, ask a tax professional. Below are some of the most commonly overlooked tax deductions you don’t want to miss. One of the more commonly overlooked tax deductions for individuals is related to changing jobs. I have not changed jobs for some time, but I have a younger brother who did a few years ago. He moved 1,000 miles for his first job out of college. While he hated moving, a lot of those expenses are tax deductible. If you’re a college student and staying local, the moving costs likely aren’t tax deductible. For my brother, he was able to deduct gas and lodging costs he incurred during the move. That resulted in a nice deduction for him. 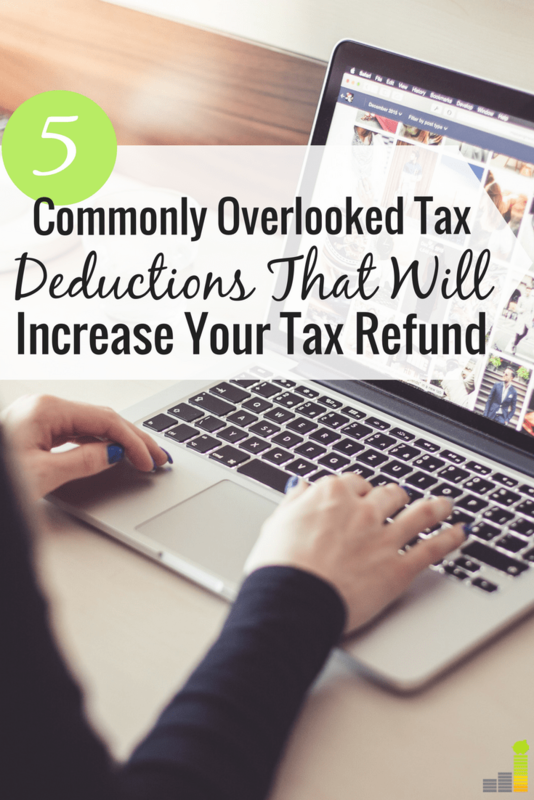 Those are but a few of the overlooked tax deductions that might be open to you. Just make sure to do your homework to make sure you qualify. Do you have a high-deductible health plan (HDHP)? If so, it’s likely you qualify to have a Health Savings Account (HSA) to help supplement costs. Your employer may offer access to a HSA, but many won’t. You also may be self-employed and need access to a HSA. You also have until the tax filing deadline of April 15 to open and fund a HSA. If you were in an active HDHP in 2018 that means you can put away $3,450 for an individual or $6,900 for a family. The other option is to invest the funds you have at Lively with TD Ameritrade. This lets you invest in their full suite of commission free ETFs, plus many other investments. Lively also lets you invest 100 percent of your funds. If you don’t have a HSA, Lively is a good choice to start saving or investing money and get a tax deduction. If you don’t have a HDHP and want to take advantage of investment related savings, a Traditional IRA is a great option. The contribution limit for 2018 is $5,500. Ally Invest is a great option with trades as low as $3.95, plenty of free tools, and access to over 8,000 mutual funds. The 2018 tax deductions that I pay particular attention to are those that qualify as self-employed tax deductions. I’m self-employed so I’m always mindful of overlooked tax deductions for small business owners. Taking advantage of them means more savings, which I want. Tax or accounting software, like H & R Block – there may be cheaper options available if you prepare them yourself, such as TaxACT or E-File. Some of them, like TaxACT or eSmart Tax may be free of charge! These are just a few of the tax deductions we’re able to take because we’re self-employed that help us lower our taxable responsibility. If those don’t fit your situation, my favorite overlooked tax deduction for entrepreneurs is for baggage fees airlines charge when you travel for business. With that last point, many were done away with at the end of 2014, but some might still be available to use. Don’t miss this overlooked tax deduction, especially if it could improve your tax standing. Giving to charity is important to help those in need. You also get a tax benefit, in many cases, from it. If you want to take one of these often overlooked tax deductions be mindful that you must itemize your taxes. If you don’t itemize, then you’re typically not able to claim charitable donations as deductions on your taxes. Many think of charitable giving as simply taking a few things to the Goodwill. 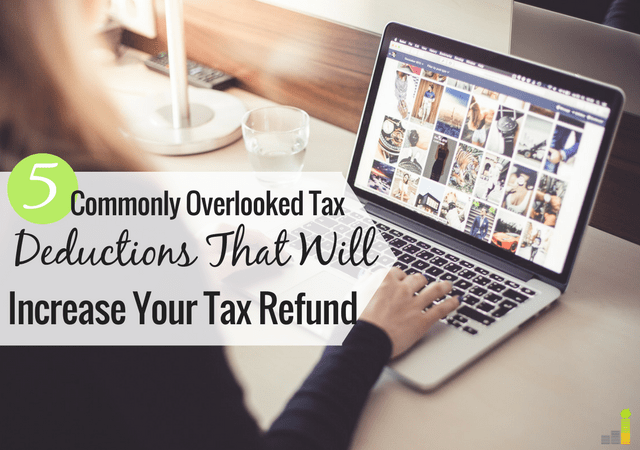 While that does qualify for a tax deduction, there are others that may fit in the commonly overlooked tax deductions category. It’s always a challenge to know what to value donations to places like Goodwill. This handy little chart they provide gives the amounts they value items at. So, make sure you value that sweatshirt at $5 as opposed to the $50 you give it. Be careful not to overlook any deductions as you prepare your taxes. They may not seem like they’ll do anything, but you’d be surprised how much money they can put in your pocket instead of going to Uncle Sam. Additional resource: If you’re looking for a simple way to stay on top of all your finances, then check out my favorite tool – Personal Capital. Completely free, it allows you to track your spending, monitor your bank and investment accounts and watch your net worth plus many other tools. Open your free Personal Capital account today! Have you started preparing your taxes yet? What is another overlooked tax deduction that you can think of that would be helpful to know? Very helpful tips here, John – I would not have thought of the newspaper and journal subscriptions! We are slowly learning what is deductible in regards to our small business, and have started doing things like hiring our oldest to help out with our workload in order to make our business run more efficiently and keep some more of our earnings within the pockets of our family. Glad to be of help Laurie! That is an easy one to overlook – but if it applies to the industry you’re in then it should easily qualify. That’s AWESOME you’ve hired your oldest to keep the earnings within the family, we plan on doing the same thing – it’s a no brainer in my opinion. I have not started ours yet (it is on my to-dos for next week, so if I start blogging lots of rants you will know why), but this is the first year with a company to consider, so this was really helpful. I have decided to go through the process myself this first year so I could “understand” the ins and outs as much as possible. Worst case scenario, I will reach out to my accountant friend, but I feel as though you don’t really understand the process until you go through it yourself. Lol, I’m hoping our return doesn’t result in any rants of their own. 🙂 That said, glad to be of help. I did the same thing the first year or two as I had always done our taxes. I did find that it was helpful to do that so I could understand what was going on more in depth, until it became too much for me to handle confidently. That’s awesome you have someone to reach out to if you have the need! Good tips. I have a CPA that does our taxes and he always picks in to our information and asks questions to make sure we haven’t forgotten thing. I always do my own ‘estimate’ and he’s never failed to deliver a higher number on our return, and it’s all stuff that’s on the up and up, just that I may have forgotten or not understood. Thanks MB! I do much of the same thing with our CPA. He generally gives us a framework to operate from each year and I operate off of that. It’s always nice to get that pleasant surprise. We’ve still yet to itemize our taxes, but maybe someday we can start taking advantage of these sort of deductions. I think 2014 may be the year! We didn’t itemize for 2012 taxes, but did the previous year. It’s looking like we’re going to have another itemizing year this year though. I need to check out that calculator for donations. It seems like such a pain that we don’t usually count them. We do track our miles when doing volunteer work and going to doctor appointments.